The hardest part about doing Kentucky Restaurant Reviews? You’re looking at it. I have to relive the deliciousness of food such as Double Dog’s Mushroom & Swiss Burger and Onion Rings while I’m, literally, miles away from having another. This is agony. My husband and I took one of our beloved one day mini-vacations through Kentucky last Saturday. I LIVE for these trips. I’ll let you in on a little secret: When I’m under the weather or going through something that rips at my nerves (you know – dental visits, agonizing ballgames that are way too close for comfort…), I make everything in my world alright just by thinking about these little trips. I picture us driving down the road, enjoying the scenery and a conversation or sitting in a Kentucky restaurant enjoying a meal and a conversation (note: there’s always talking if I’m involved). While I LOVE eating at favorite restaurants, I also get a huge kick out of discovering new favorites. Such was the case Saturday when I was treated to, not one, but two restaurants I’d ever eaten at before. Mark my words, I’ll be returning to each one millions of times. I’ll tell you about our special supper destination in the next post, but I’m going to let this restaurant review go to the dogs…. Double Dogs. We ate lunch at one of the cutest restaurants I’ve ever seen, Double Dogs in Bowling Green, Kentucky. How could an animal lover extraordinaire not fall in love with this place?! While walking into the restaurant, the Double Dog doghouse, with its barking invisible dog, caught me of guard. The highlight of my husband’s day (or week) may have been when I jumped out of my skin. I got a kick out of it, too, but an even bigger kick out of walking in the door and seeing trees filled with information about, and pictures of, precious shelter dogs and cats that are looking for a little love. A restaurant with a heart of gold? You had me at hello. Our adorable server took care of us right off the bat. I was actually shocked at how fast our food arrived. I ordered the Mushroom & Swiss Burger with Onion Rings (you know my ring obsession) and my husband Michael ordered the Betty Burger, fries, and coleslaw. Double Dog’s famous Betty Burger is a ridiculously delicious single patty with American cheese, topped with their (very) special sauce, grilled onions, tomatoes, lettuce and pickle. Words cannot describe just how amazing this sauce is. Combined with a burger that can only be described as PERFECT, this makes a stupendous hamburger. Betty is perfection. 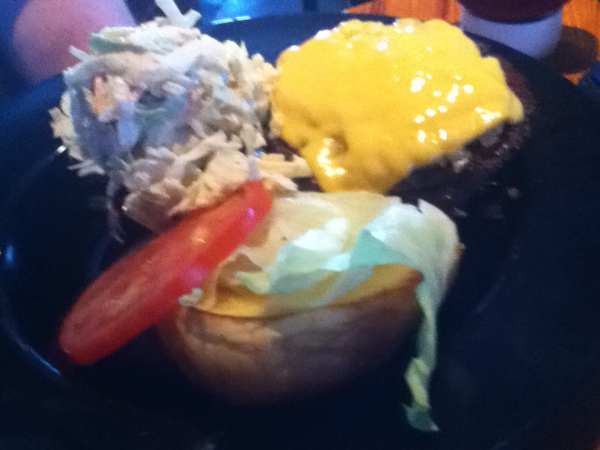 Gumbo’s Mushroom Swiss Burger is topped with grilled onions, mushrooms, Swiss cheese, mayo and Dijon mustard. This is unlike any Mushroom and Swiss burger I’ve ever had and, believe me, I’ve had them all. It’s a favorite burger of mine, so I’ve ordered it far and wide. Double Dog’s Mushroom Swiss Burger doesn’t have the sauce that you’ll find on a lot of Mushroom Swiss burgers. It has, instead, Dijon mustard – which, surprisingly enough, is quite delicious. This is actually one of the few restaurants where I’d consider ordering fries as much as I would my beloved onion rings. I say consider because their onion rings were off the charts spectacular. To be on the safe side, make sure the people at your table order each – trust me, you’ll want BOTH the fries and the onion rings. The coleslaw was good, at first bite, but it became delicious after being graced with a little salt and pepper. Apparently coleslaw and pasta salad are new items at Double Dogs in Bowling Green. I can’t wait to try the pasta salad – I’m sure, like everything else they’ll be extraordinary. As huge sports fans, we also LOVED that we were surrounded by tvs, each with sporting events to enjoy. Great onion rings and fries, some of the best burgers on the planet, and sports everywhere you look? How is that not paradise? This beautiful and fun restaurant, with food so delicious your knees get weak, is open for lunch everyday at 11:00 am. Sunday through Wednesday, they’re open until midnight and Thursday through Saturday, you can feast on deliciousness til 1:00 am. 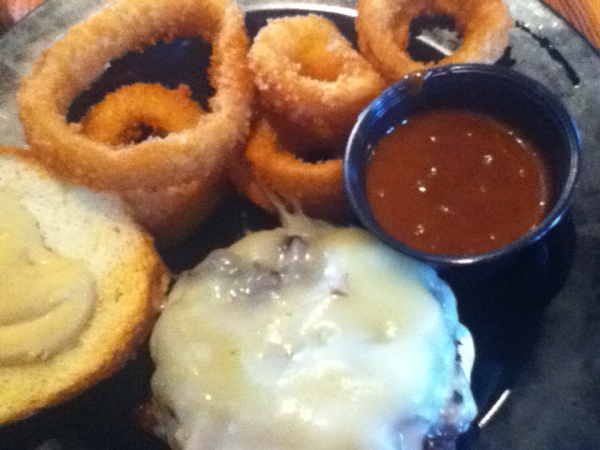 Double Dog’s burgers, fries, and onion rings are to die for and their wings look sensational. Check out Double Dog’s menu HERE. Better yet, just go and “wing it.”Ã?Â Sorry I couldn’t resist. Double Dog’s is located at 1780 Scottsville Rd. in Bowling Green, Kentucky. Go as soon as you possibly can and then pray, just pray, that they’ll one day open a location in your city. Double Dogs’ Betty Burger and Coleslaw. I’m not sure you’ll find a better hamburger in Kentucky or anywhere else. There’s always something fun going on at Barren River Lake State Resort Park ! Beautiful Barren River Lake State Resort Park never fails to impress. Maybe you’re a photographer looking for incredible photo ops or a diner looking for great catfish in the lodge’s restaurant. Maybe you’re a boater, fisherman (or woman), or golfer looking for their next great challenge. Or maybe you’re simply looking for rest and relaxation surrounded by Kentucky’s awe-inspiring beauty. 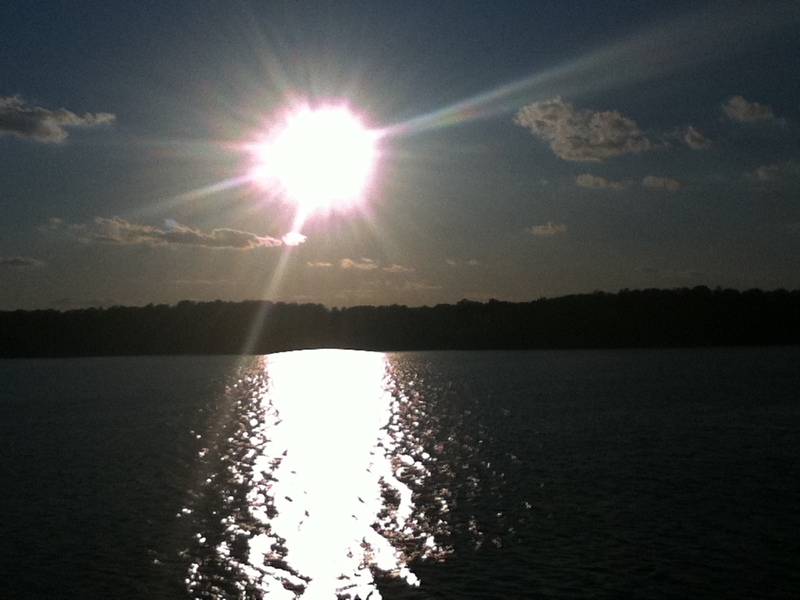 Whatever you’re looking for, you’ll find it.. and more… at Barren River Lake State Resort Park. They have something special in store for bird lovers in January and February. Each year thousands of sandhill cranes make Barren River Lake a stop on their journey back home. Join Barren River Lake State Resort Park during its Nature Watch Weekends to get up close to these beautiful cranes as they migrate through the area. The weekends, Jan. 20-21 and Feb. 17-18, 2012, will consist of educational sessions conducted by Wayne Tamminga, a wildlife biologist with the Kentucky Department of Fish and Wildlife Resources, on Friday evenings at 7 p.m. CST. Participants can register for one of two trips. The morning sunrise trip takes guests to the roosting site before sunrise to experience the beauty of the cranes leaving the roost as they journey to nearby cornfields to spend the day. The sunset trip begins by viewing the birds in the cornfields and ends at the roosting site so you may view the magnificence of thousands of cranes circling overhead as they get ready to settle down for the night. Each of these trips will be led by naturalists from the Kentucky Department of Parks. Registration is $30 per person and includes the evening session, a sunrise or sunset field trip, boxed meal, and a T-shirt. Registration forms are available online at http://parks.ky.gov/calendar/details/nature-watch-weekend–sandhill-cranes/16254/ or by contacting Jamie Avery at 1-800-325-0057. Please note that the dates selected are based on historical records under normal weather conditions in January and at the end of February, and past trends of the cranes’ arrival in this area. Please be aware that this narrow window of opportunity can vary by several days based on weather and the cranes’ migration schedule. Barren River Lake State Resort Park, near Glasgow, has a lodge, cottages, Driftwood Restaurant (amazing catfish! ), golf course, fitness center, gift shop, fishing, picnic areas and hiking trails. The resort is located 44 miles southeast of Bowling Green and 15 miles south of Glasgow. Take I-65 to the Cumberland Parkway east, to US 31E south.